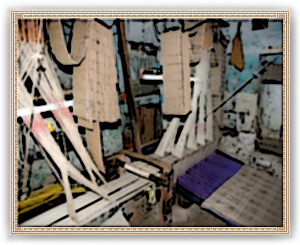 Textile Mill provides above average impact into the trade of the region, which is even greater if there is local resource of dyes to complete the process of cloth fabrication. Of course the trade is much higher in summer during the linnen harvesting season. Linen has been used for table coverings, bed coverings and clothing for centuries. The exclusivity of linen stems from the fact that it is difficult and time consuming to produce (flax in itself requires a great deal of attention in its growth). Flax is difficult to weave because of its lack of elasticity, and therefore is more expensive to manufacture than cotton. The benefits of linen however, are unmatched. Due to the parallel arrangement of its fibers, linen is a stronger, sturdier fabric than cotton. In addition, linen is highly absorbent. The subtle combination of firmness and softness of linen make this fabric a favorite. Linen products tend to outlast cotton, enduring up to 20 years of use.